Greek Default Watch: Should Privatizations Be a Priority for Greece? Should Privatizations Be a Priority for Greece? Privatizations are once again are at the center of the public debate in Greece. Should privatizations be a priority for Greece? Let me start with three observations. First, there is no doubt that the state has legitimate interests which markets will not fulfill on their own. For example, flying regularly to a remote island may not be a profitable proposition and one that the market will not provide at sufficient quantities. Yet a state has an interest in ensuring that all its citizens are connected. This is just one example. Markets will no doubt fail to provide certain goods and services that a state should want provided. Second, private companies tend to be better managed, but not all state owned enterprises (SOEs) are inefficient – some (but not many) are indeed world class. Nor are private companies perfect – many lose money and engage in harmful or outright criminal behavior. Left unsupervised, private companies can undermine the public interest. We should neither dismiss public companies nor idolize private ones: believing in private or public enterprise should be an empirical, not an ideological position. Third, the agent-principal problem applies to both public and private companies. Companies are meant to serve their shareholders, but they often serve their managers and employees instead. This happens due to information asymmetries, perverse incentives, and a pure inability to control a company’s day to day operations. Therefore, not every decision will be in the interests of the company’s shareholders, whether these are private investors or the state. What then distinguishes private from public ownership? The most important difference is the possibility of failure. If a company cannot compete, it will go bankrupt. In private enterprise, this is a constructive force and allows resources to move from unproductive to productive uses. But SOEs rarely go bust. For one, states often own companies because they do not think that profit is their chief function – instead, they are presumed to serve some public interest. Rather than shut down unprofitable SOEs, states recapitalize them and socialize their losses. Even if states want to shut them down, they may not be able to due to social pressures. If a car factory cannot make money, people may protest its closure but there is nothing they can do about it. But they can petition a government – and vote-hungry governments often listen to those petitions. Why is this problematic? Three reasons. First, the absence of failure distorts incentives. Without failure an SOE has little incentive to invest, to offer superior services or to keep costs down. Survival depends on political connections. Therefore, the company no longer serves its customers (their view does not matter) or the state in a broader sense. Instead, SOEs need to cater to political interests to keep the money flowing. At a minimum this structure creates bad products and services. The second problem is that such behavior distorts the markets in which the public company operates. SOEs tend to dislike competition since it underlines their own inferiority. Who wants to work for the company that has crappy 30-year old planes when your competitors have shiny new planes? Competition separates the good from the bad. Thus, state companies tend to lobby the governments for restrictions and regulations in their industry and they can even directly undercut competition by offering very low prices (as losing money is not a problem). Of course, these efforts are couched in the name of consumers’ or the public interest – they are presented as a concern for prices or reliability in “strategic” sectors. Almost always, these arguments are a sham: instead, state companies want to protect their own privileges and will do anything to do so, including undermine other companies that can deliver the same service more cheaply and reliably. Consumers not only get bad services but they are also likely to be prevented from a chance to get the same service from private providers. The third problem is that the inability to shut down companies has costs. When the state puts money into SOEs, it does so by either taxing people or borrowing money on their behalf. There is no free lunch: people pay for these companies either directly (by buying their products) or indirectly (by financing the state). A train ticket may cost €15 but if the state-owned railroad company runs a deficit financed by the state, the real price is above €15 – and in fact, people who do not use this service subsidize the people who do. In that process, however, the state loses sight of costs and benefits. Greek state owned enterprises lost €2 billion in 2011 (before financing from the state). Is what Greece got in return worth €2 billion? Is it worth €2.6 billion (what they lost in 2010)? These questions become very hard to answer. It is easy for me to ask, do I want to pay €150 to fly from Athens to Thessaloniki? But when there are hidden costs, it’s much harder to compare costs and benefits directly. Cost-benefit analysis becomes too opaque. These critiques prompt a question: can the state safeguard its interests without owning a company? Take the example of the unprofitable flight route mentioned above – clearly there is a state interest and clearly the market will under-provide this service. But the state has many ways to deal with this. It can, on one extreme, own a company so that it can directly provide this service. Or it can merely pay a private provider an amount that will make that provider want to supply this service. In a perfect world, the burden of the two options would be the same. But this is not a perfect world and so the difference ends up being much higher under direct ownership. Or the state can impose regulations on the private sector – make the right to fly contingent on servicing these unprofitable routes. There is a wide spectrum of options and owning a company is an extreme and costly way of getting something done. So far, this is generic analysis, although given a natural suspicion towards markets, it is never a bad idea to restate the basic principles. Let us now turn to Greece. Most SOEs in Greece lose money – that, in itself, is a case for privatizing them. But financial results should not be the sole factor. Assume that Athens had an amazing metro but the company lost €1 a year; should the company be privatized? Maybe not. Maybe €1 a year is a tolerable subsidy for a perfect metro, even though the private sector could probably better service. At the same time, we ought to ask ourselves, is this result sustainable? Can the company open new stations and invest in new trains if it does not make money? If not, then maybe it should be privatized. Conversely, let’s assume that a company generated profits – is that an argument against privatization? For one, if it has a monopoly, profits are easy. The company may also be “milking” old assets – it can earn a profit but it does not have enough money to invest. Imagine this: let’s say I own a newspaper and one day all the journalists quit and I replace them with third-rate journalists. For a while, this can remain a profitable company: it will be a while before advertisers pull out and subscribers stop buying the paper. Short-term profits may even go up because costs went down (by hiring cheaper staff). But current profitability masks an inevitable decline. In Greece, the case for privatizations rests on four pillars. The first and most obvious is financial. Greece cannot afford to subsidize companies. These companies will no longer have funds to carry out their essential duties. In June 2012, for example, the power company secured a set of loans for €525 million with interest rates ranging from 7+ to 11.9%. In this environment, the company’s ability to keep going is severely impaired. Second, SOEs tend to be inefficient and provide services at a higher cost than private companies could. Even if the state could afford to subsidize SOEs, it shouldn’t. The most glaring evidence comes from data published by the Ministry of Finance showing that salaries at SOEs were twice as high as the average salary in the private sector in 2008. This is hard to justify on productivity or other bases. The taxpayer is paying a lot of money extra for services that tend to be substandard. Third, privatizations are an essential component of broader market opening and deregulation. The power market is a perfect example again: as long as the power company retains its current form, competitive markets will be nearly impossible to form. It is hard to achieve more competition and lower prices without also changing the ownership of what is usually the biggest or the only company in an industry. What is true for power is true for other sectors. Fourth, Greece needs to signal its commitment to change. Privatizations tend to be politically tough, especially in countries such as Greece, where skepticism of markets and where the power of labor unions are both high. No wonder many analysts see the looming clash between the government and the power company as the first real test: will the government really stick to reforms? If privatizations are delayed, people will become increasingly doubtful that Greece can actually change. Experience teaches us three things about how to privatize. First, the process of selling assets should be fair and transparent. Second, privatization needs to be accompanied with a broader market opening – there is no sense in turning a public into a private monopoly. And third, privatizations require regulation: functions that were previously either not needed or performed by SOEs will be now performed by the state. To do this the state needs to upgrade its capacity to regulate these new industries and to ensure that market competition is indeed serving the public interest. The most serious and perhaps only objection to the case for privatizations is timing. Greece is unlikely to get a great value for its assets; why sell now rather than wait? This is a legitimate concern, even though realistically Greece cannot afford to wait. But there is different way to ask this question: can Greece achieve its economic and political goals without privatizations? Can it reinforce a sense of justice that it is willing to stand up to labor unions; can it put its public debt on a sustainable path; can it open up industries to attract investment; can it communicate domestically and internally a serious willingness to liberalize the economy; can it do these things without privatizations? I think not. And that is the reason privatizations are so essential. "why sell now rather than wait?" Because in the medium run, the price will only sink lower. There's a prominent example for this among the few privatisations that took place so far: When the Troika started to demand the selling of state owned companies, Greece's share of the telecom corporation OTE was worth around 700 million Euros. But the Greek administration dragged their feet, undoubtedly encouraged by politicians who either opposed all sales of SOEs or who believed that the stocks are worth more than that. Years later, when the bad news from Greece had seriously reduced the interest of the investors, the OTE share was finally sold for about 350 millions! So, sorry, but the idea that the prices will rise is simply delusional. As long as the economy is depressed, they won't. And without privatisations, it's highly unlikely that there will be a recovery. The government hasn't the money to create jobs, so it has to rely on other investors. And those will only come when there are realistic opportunities to make some money. This requires privatisations and the removal of counterproductive roadblocks. Allow me to add a couple of “Austrian perspectives” to this excellent article. Until the 1970, Austria’s public sector accounted for over 50% of the economy (the reasons for that had to do with post-WWII issues, i. e. to protect against expropriations by the Soviet Union). Post-WWII Austrian politics were based on a 2-party system where the two parties (People’s, Socialists) accounted for 80-90% of the vote. They soon discovered that, instead of fighting each other, it was much more comfortable to form a coalition and to divide the country fairly and equally amongst each other. For that, they had entered into a written Proporz-Agreement which stipulated that all leading positions in the public sector were to be awarded proportionally, relative to the results of the last election. And if the leading positions are split proportionally, those leaders will make sure that all jobs below them follow the same logic. The following joke became popular: for each public sector position you need 3 people. One “black”, one “red” and one who does the job. Not that far from the truth! So the first point I would add is: there is no way to avoid party influence in a public sector company. There will always be people for whom politicians “have to find a job; an ‘adequate’ position” and they will be placed in public sector companies. Therefore, public sector companies are split from top to bottom into two camps (and often into two cultures). Those who prefer to remain neutral really don’t do themselves and their careers a favor. What develops is the opposite of a meritocracy. Some of the results are: distrust, envy, unfair play, etc. In short, the quality of the social system deteriorates enormously. Secondly, there is no way that a public sector company like in the Austrian scenario can be managed like a private sector company. First of all, the managements are political appointments, and generally not experts at management. But even if they were, they can’t manage freely. The largest Austrian corporation then was the state-owned steel company Voest. It was public knowledge that the head of Voest’s workers’ council (Betriebsrat) had more to say than the CEO and his board members. Why? Suppose the board did something which the head of the workers’ council did not like. This head would then call the Chancellor of the Republic and complain. And now get this: the Chancellor of the Republic would accept the phone call of the head of the workers’ council of a steel company, listen to his complaints and then call the CEO of the steel company to give him a dressing-down for taking decisions without first having them approved by the workers’ council! Thirdly, the public sector is a wonderful instrument to “shave-down” unemployment statistics. You simply have the public sector employ those who would otherwise be unemployed. An Austrian Chancellor then coined that unforgettable phrase in a speech to the workers’ council of Voest at a time of national debate about the dangers of a rising public debt: “And I repeat what I have said on many occasions --- a few billion more in public debt cause me a lot less sleepless nights than a few thousand unemployed would”. Standing ovations, of course. I hasten to add: it is not really the ownership per se which is the issue (I have seen excellently managed public sector companies elsewhere). What matters are the motives behind the owners. A private owner might even be worse than a public owner if it is a brutal financial investor who has little interest in the long term viability of the company but top interest in maximizing his short-term financial profit. The problem is: when the state is the owner, you have no choice over the motives. Politicians generally have the same motives. When you privatize a company you do have a choice of the new owners’ motives. You might reject the financial investor and prefer a strategic partner with long-term objectives (even if he pays a little less). Whether or not the price is good for Greek public sector companies in the midst of today’s chaos is irrelevant, in my opinion. Any sale can be structured in such a way that the state can compensate for a perceived lower sales price through options on future profits. For example, one would establish a base case for, say, 10 years reflecting today’s rather difficult situation and give the state the option for additional benefits should the base case be exceeded during those 10 years. For Greece, I think the most important argument for privatizations is the know-how transfer that goes along with it. Put differently, a privatization which does not assure know-how transfer is not a defensible privatization. A multinational which extracts the R&D resources back to its own Head Office and leaves an operating shell in Greece should be discarded. A financial investor should not even be talked to. The ideal investor would be someone who wants to build up competences in Greece. Perhaps not only for the Greek market but, more importantly, for regional interests. An investor who does not shut down when labor costs become cheaper in, say, Bulgaria. An investor how has a proven track record of a long-term philosophy and who is prepared to make a long-term commitment to Greece. Such investors do not exist? I believe there are a lot of them but perhaps many of them are not publicly-traded companies. As always, great comments Klaus - much appreciated. What should be added: it is also important, which problem the SOE addresses. It makes no sense for a state to own a steel company (so sell it) as it makes no sense to privatize infrastructure since you end up with a private monopoly, which is worse than a SEO since you have to regulate it anyway. It is also no good idea to privatize eg. hospitals, since patients are not in the position to act as true consumers. And it makes no sense to privatize areas, where the only customer will be always the state (eg. education) and where the state defines the service compeltely. In such sectors private companies do not serve better, since the cost benefits come only from lower wages and not from increased productivity. Lower wages also has its costs to the society, but are paid elsewhere. For this reason, in Germany we retransfer tasks, that had been privatized back into SEOs, since privatization increased the costs in total. I think, you have to check individually, what to privatize and what to keep. And maybe to invest some brain in how to organize SEOs. A good way to have an extended view on running companies is eg. Yunus "Social Business". What he shows, is, that the motivation, which lets you run a business is important. So when altruism can be a motivation as good as hedonism, to run a company, maybe it is worth thinking, how to setup a SEO, why to run it, rather to see it just like ordinary company in public hands. First of all, thank you for your excellent blog which does so much to enlighten and clarify the difficult situation in which Greece finds itself. Here in Norway, there is a lot of discussion about Greece and its problems, and I recommend everyone to read your articles and give the link to your blog. I think your work is outstandingly honest and courageous in times when it is all too easy to hide behind an extremist stance. Privatization is a difficult balance. For instance, we have a very extensive airport network in Norway, with about 50 towns (some with just 2-3000 people) that have a regular air service. In a country with only 5 mill., that is a lot, and expensive. The state subsidizes this service, and airlines compete for the job every few years, where not only price is decisive, but also the quality of the service provided. It works fairly well, as people are more or less in agreement that these remote places should have good communications with the rest of the country. Also, the SAS airline, originally a great example of Scandinavian cooperation, is still to a large extent owned by the Swedish, Danish and Norwegian state. The governments want to sell these shares, but a the moment, SAS is not doing too well, and they hope to sell for a better price when (or if) the company can be more appreciated in the market. But with many strong union interests, this looks like an uphill job. Actually, the Norwegian state is a major force in our stock market and operates many of the largest economic forces, not least in the oil indsurty, in order to safeguard the nations's interests. Here, the state companies are not easy to distinguish from private companies, and they follow the normal rules for competitiveness. It works fairly well. In Greece, however, I think there should be a consistent line of selling out state enterprises, even though it will not bring in as much money as expected. The main point here is not to get money for the state (although every contribution is welcome), but to cut out the great amount of dead wood and unfair competition. Maybe one time in the future, you can then decide to go back to a more or less state operated service in those sectors that are regarded as essential to society, but that must be on a more accountable and transparent basis than today. Thank you for your kind words Henning. Statoil was one of the few exceptions I had in mind when I wrote, above, that there are indeed world-class SOEs. The exceptions tend to correlate with how much the government interferes in the company's workings. If you can get that boundary right, you can get some good things from an SOE. But as rightly point out the broader market distortions are much a motive for privatizations as anything else. 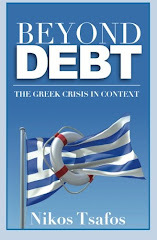 Has the Greek government committed itself to "privatize", or to sell shares of state companies? May be, it doesn’t make difference to " TROIKA ", but it does make difference to Greek people. Precisely, to "privatize" means to transfer shares from state to private sector, in any case. Otherwise, this is not privatization. This is just selling the shares no matter to whom, and very unexpected results could be obtained. For example: I live in Croatia. Ten years ago the Croatian government decided to privatize state oil company INA, under the provisions of special law " INA-privatizations". offers were submitted by Hungarian MOL ( probably private in time of tendering ), Russian state oil company Rossneft, and half-state, Austrian OMV. MOL’s offer was accepted, not because of MOL was private. The offer was the best in financial terms. A year ago, new Hungarian government ( premier Victor Orban ) bought 23% of MOL shares, and became the biggest single shareholder. So, it means that Croatian government sold its shares to Hungarian state, under the provisions of special privatizations law. Very strange privatization, isn’t it?